Earlier this year Foxwoods ended its 10-year relationship with the World Poker Tour, going so far as to remove all of the WPT branding from its 100-table poker room, and announcing that for the first time in 10 years the World Poker Tour will not be making a stop at Foxwoods in 2013. However, this week Foxwoods has announced a new partnership with an even bigger brand, the World Series of Poker. Foxwoods will host a World Series of Poker Circuit Series event beginning on March 27, 2013, with a $1,500 Main Event Scheduled for early April, April 5th- 8th to be precise, and in all, the WSOPC stop at Foxwoods will award 12 WSOPC rings in 12 days in its first major tournament series post-WPT. Foxwoods is one of the biggest card-rooms in the world, and is considered near the top of East Coast poker rooms. Located in the middle of the Connecticut wilderness Foxwoods hosts a number of tournaments throughout the year including the Mega Stack Challenge (with the 25th and 26th running of these events scheduled for 2012) and the Foxwoods World Poker Final, one of the most prestigious and longest-running tournament series on the East Coast. For more information on the WSOPC you can visit the www.wsop.com website. 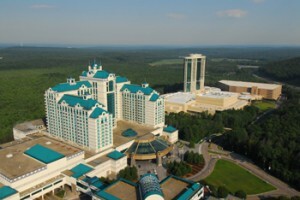 For more information on Foxwoods you can head over to www.Foxwoods.com.